Franz Jantzen has one of the more interesting lives among Washington photographers. By day, he’s a collections manager of graphic arts at the Supreme Court. Until recently, he worked as a freelance darkroom printer for the Library of Congress, developing images from the library’s fabled archives, a gig that recently came to an end due to changing technology and demand. Jantzen is also a fine-art photographer, one whose innovative—and painstaking—digital technique is currently on display at Hemphill Fine Arts. I was first impressed by Jantzen’s space-bending approach in 2009, when one of his images was included in a group show at Hemphill. The 57-by-172-inch photograph portrayed a food-display table at a county fair. Rather than making a single photograph, Jantzen stitched together countless smaller ones to create the larger image. But even more striking was the perspective: Viewers were able to scrutinize the finest details of the cornucopia as if they were hanging from the ceiling. At virtually any grid point in the photograph, you were looking straight down at the table; there was no foreshortening or subtle recession of the more distant edges. Other artists, from David Hockney on, have toyed with stitching together many photographs into one. Today, Photoshop makes it easier than ever. But Jantzen’s use of the vertical perspective offers something bracingly new to this familiar approach. Maybe it was just the shock of the new, but none of the images from Jantzen’s current show pack quite the punch that the county-fair photograph did. Still, the solo exhibit includes a number of impressive works. 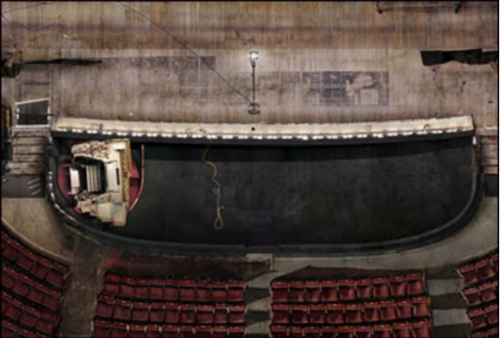 One image lingers lovingly over the floor of Loew’s Theater in Jersey City, where, according to legend, a young Frank Sinatra heard Bing Crosby in concert in March 1933 and decided to become a singer. The theater, now run hand-to-mouth by a nonprofit, shows its age in its tiniest details—worn velvet seats, heavily frayed floorboards. The most notable sign of life is the curlicue of electrical cord that meanders gracefully over the stage. Jantzen says the image took 95 hours to stitch together, and it shows. Another image is far simpler, though still hardly straightforward—an image of a stump surrounded by grass. Seen from above, it could easily be an aerial photograph of a pool of polluted water; it takes a few glances to figure out exactly that it’s the remains of a tree. Most strikingly, Jantzen records a decaying display in the somewhat grimy front window of a wedding photographer’s shop, echoing Walker Evans’ famous image of photographs lining the front window of a portrait studio. In Jantzen’s version, though, the top row of color photographs in the display are in fine shape, while the lower rows devolve into an eerie, blue chemical mess overlain with ghostly human forms. One can’t help but wonder why the wedding photographer let his window display go for so long, but we’re fortunate that Jantzen stumbled into it and rescued the odd tableau from obscurity.